Pepper Kirk’s life was finally perfect. 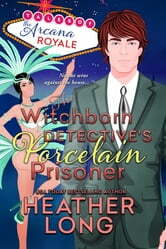 Until a federal agent with an ax to grind arrives at the Arcana Royale, determined to catch the casino in corruption. In order to protect the casino she owes her very existence to, she agrees to help the handsome agent—and sabotage his surveillance while she’s at it. Finn Mickelson’s investigation into a crime family is only a smokescreen to keep his real targets off balance. Nothing will keep this witchborn from digging into the secrets of the Royale—not even a Southern belle with honeyed tones and a sweet smile.